All things must end, and it's time for The Doctor to come to the one place he truly fears: Trenzalore. 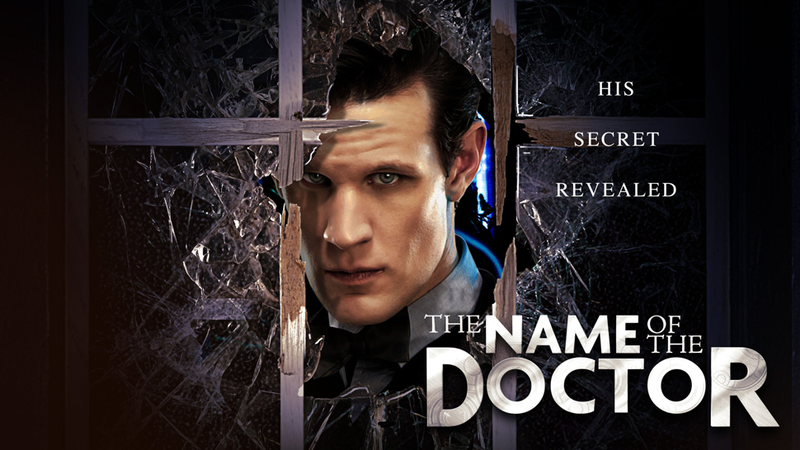 With not just friends in danger, but his past, present and future, The Doctor must face his gravest of secrets. But with the Fall of the Eleventh nigh, he must also discover why Clara Oswald is so important to him... Spoilers, of course, beyond the cut! The Name of The Doctor is bookended by two fantastic moments - moments that the rest of the episode couldn't possibly live up to - but Moffat has delivered what is perhaps his most accomplished, albeit surprisngly low-key, finalé during his tenure as showrunner. It was measured, not full of sound and noisy bravado, and surprisingly simple for one of his time-travel stories. The slower pace allowed the actors to come through and shine with their material, but most importantly, it didn't let the story just get lost in Moffat's mechanics of time travel, and leaves enough interesting questions that can bleed over into the 50th Anniversary and beyond. The nature of the 'deus ex machina' (I'd struggle to even call it that) that allowed Clara to become The Impossible Girl, spread throughout The Doctor's timeline like the shards of a cracked mirror, is perhaps the biggest contestable point of the whole story. For me, it worked, but it's the sort of 'soft reboot' thing that has plagued past Moffat-penned finalés that has really bothered fans in the past. However, I think just this once, it was actually handled well in the story (unlike The Wedding of River Song and its hamfisted Tesselecta double). But firstly, let's talk about Moment #1: That pre-titles sequence! In all honesty, I've not been overtly fond of the Moffat era's penchant for overly-long pre-titles sequences (I like a Who Story that delivers a hook and gets going, roaring into that title theme! ), but good lord, I wanted this one to go on forever! Having Clara inserted into the past incarnations of The Doctor, through the integration of old and new footage, was such a thrill to see - everything you'd want from an anniversary year, distilled into a small sequence. And what a delight it was. The Doctor and Susan on Gallifrey! Four! Bessie (I'm not going to say 'I was right'... but I was right)! Six's technicoloured coat! The (kinda dumb) cliffhanger from Dragonfire! The Moff took an idea that couldn't potentially have been drawn out for an entire Anniversary Special, á la Deep Space Nine's Trials and Tribble-ations, and just ran with it - a delightful, touching meld between the Classic and the New incarnations of the show that couldn't really have been accomplished as well in any other way. I thought Nightmare in Silver's dual personae would give Matt Smith his best acting moment of the season, but I was wrong - The Name of The Doctor showcases a calmer, less wacky (and yet still brilliantly funny, considering his fantastic use of Dalek as a curse word!) facet of the Eleventh Doctor that we've rarely seen recently, and not regularly seen since Series 5. Matt handles the emotional moments with aplomb, and give or take the occasional 'cheesy rolling on the floor' acting as he lies in the TARDIS grave's console room, it's his defining performance of 7B. He's ably accompanied by Jenna - although her nature of just standing there to ask questions and little else did annoy me - and the wonderful trio of Dan Starkey, Neve McIntosh (her in particular - I loved her moments of grief over Jenny's half-death) and Catrin Stewart as the Paternoster Gang, in a much more subdued turn compared to their last adventure in The Crimson Horror. And special mention must go to Alex Kingston, who played her final scenes (perhaps her truly final scenes? After all, the data ghost is now faded. If so, it was a beautiful way to go out) with Matt outstandingly well. My only real complaint on this front was that once gain, Richard E. Grant was criminally underused as The Great Intelligence. If the Intelligence is purportedly 'dead' now, destroyed by Clara's invasion of The Doctor's timestream, it would be a crying shame to have essentially wasted a great actor like him. A running theme this series, I've felt, between Grant, Celia Imrie, Tobias Menzies, and Jason Watkins to name a few, but I really wish there was more material with him. It's John bleedin' Hurt! And he's The Doctor!? A bad Doctor (Can I just say, I loved the title's twist in the line 'In the name of The Doctor'? Lovely moment!) who did very bad things! But who, why, what (what!? WHAT!?)? The next six months of waiting are going to be hell. But I can't wait. It's been a funny 8 weeks for Doctor Who. It's had ups and downs, controversies and complaints, but I think all in all I've really enjoyed this run - perhaps my favourite of Matt and Moffat's tenure, and my favourite since the sublime Series 4. Jenna Louise Coleman has been a breath of fresh air, and the majority of the stories (The Rings of Akhaten and bits of Nightmare in Silver aside) have been ones I've really enjoyed and wanted to go back to. From the closest we've been to RTD's Who, to thrillingly classic bases under siege, from atmospheric horror to wibbly-wobbly TARDIS goodness, I think my only real problem with the show this year is that I would've certainly liked a lot more of it. The biggest thing I want from Series 8 next year is that it runs in a consistent 13 week streak, rather than being split up. I'm more than happy to wait if that means we can have a 'full' series in one go. Split series haven't really worked so far, in terms of increasing public perception or for stymieing mid-series rating dips (if anything, they've exacerbated them, but that's a different story) and hopefully the production team can get back on track in 2014. What's been your favourite episode of Series 7B?